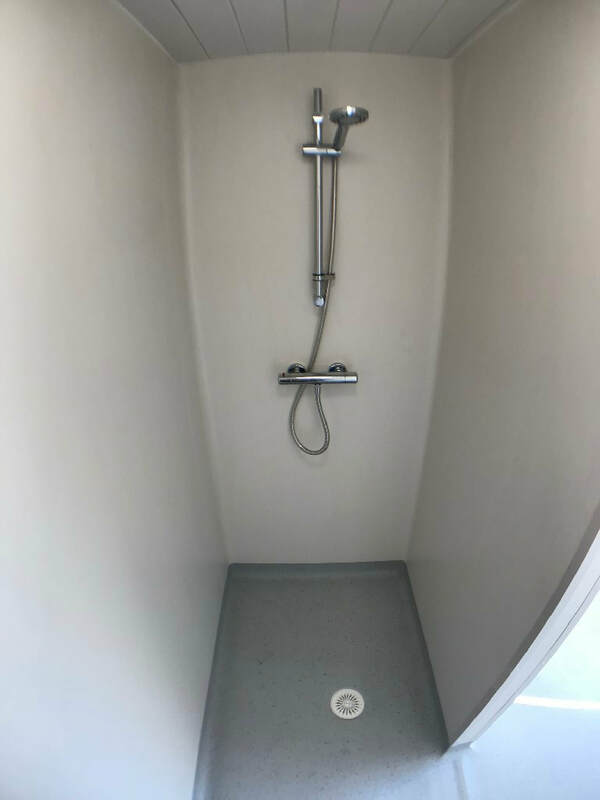 ﻿﻿This small toilet shower unit has 2 complete bathrooms, each with a shower, toilet, washbasin, mirror and heater. 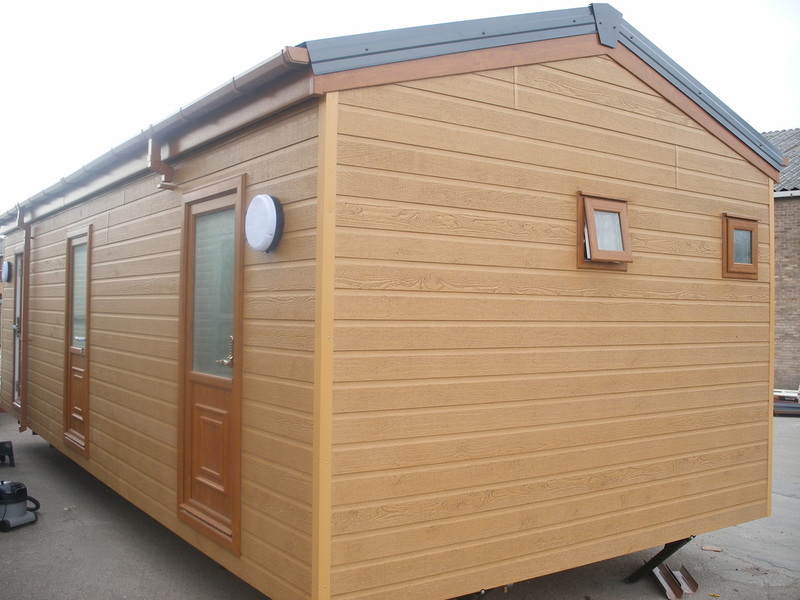 It has a pitched roof with Canexel cladding and chassis for easy delivery. Full LPG heating, PIR operated lighting, safety floor covering, PolycladTM high quality wipe down wall covering internally. 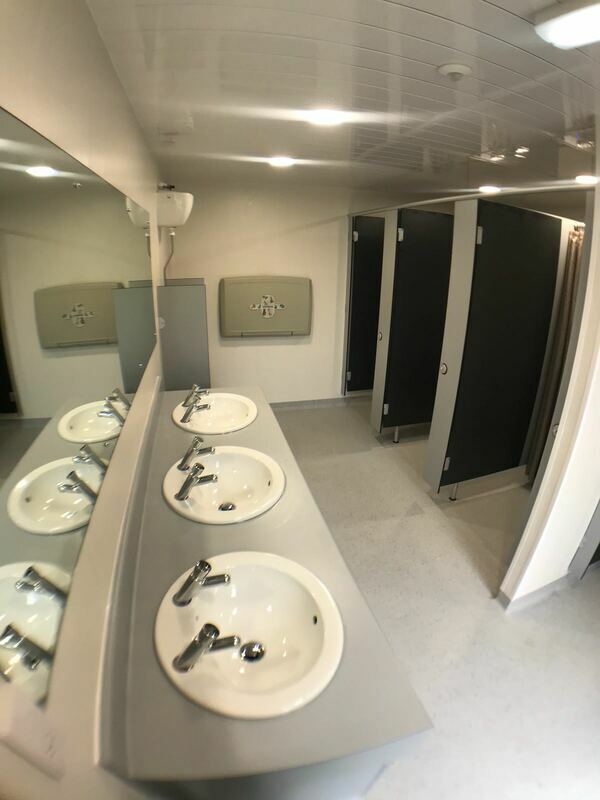 Let us know how many toilets, showers or other items you require and we will produce a bespoke layout for you to meet the requirements. Call Keith on 0845 4908824 if you are interested or need more information. 1. How many facilities do you require ? b. How many toilets ? c. Separate rooms or combined? 2. Are you happy with Unisex rooms ? 3. Do you require ‘all electric’ or mainly LPG for water heating ? Many camp sites and festival sites require a portable toilet and shower amenity block. 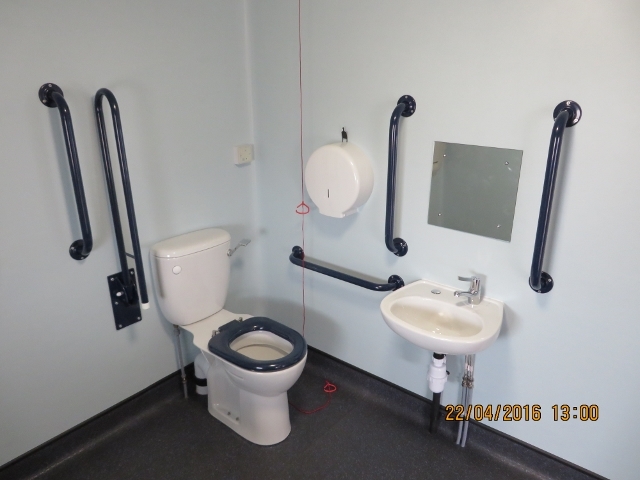 We have created this great range of campsite toilets, disabled toilets, shower rooms and wet rooms. They come in a variety of sizes, designed to fit in with the needs of your park. All units can be run from LPG or electric, they can be delivered free-standing or on a chassis for remaining portable. Ask for the brochure and price list to see the extended range of designs and options. This unit is 28x12 with a Ladies and Gents area with a central services area. With its own radiator heating system, low maintenance exterior and PIR operated lights it has a high specification. Prices start at around £37,460 + VAT for this quality, type and size of unit. We build them in a pitched roof style for that little more character and attractiveness. 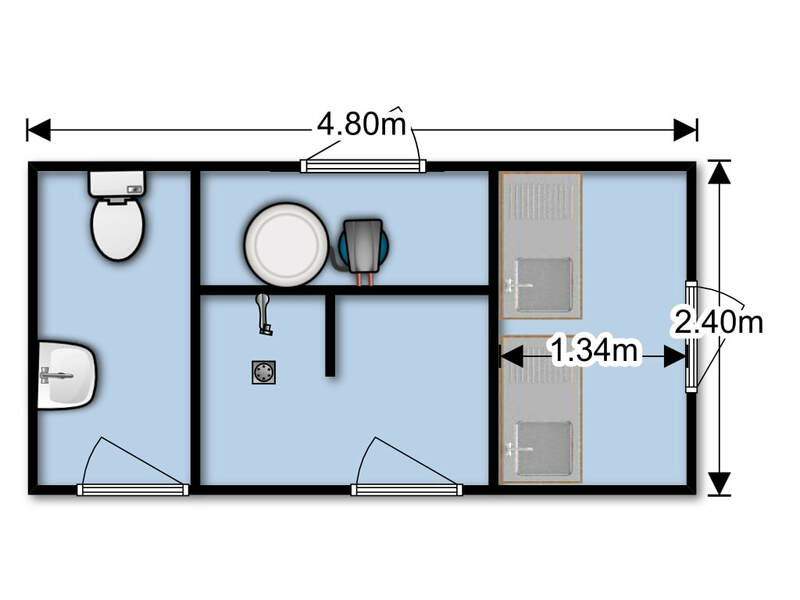 We know cost is a concern for many new camp sites, so we now have a selection of smaller units that can be delivered and ready to use at a budget price. 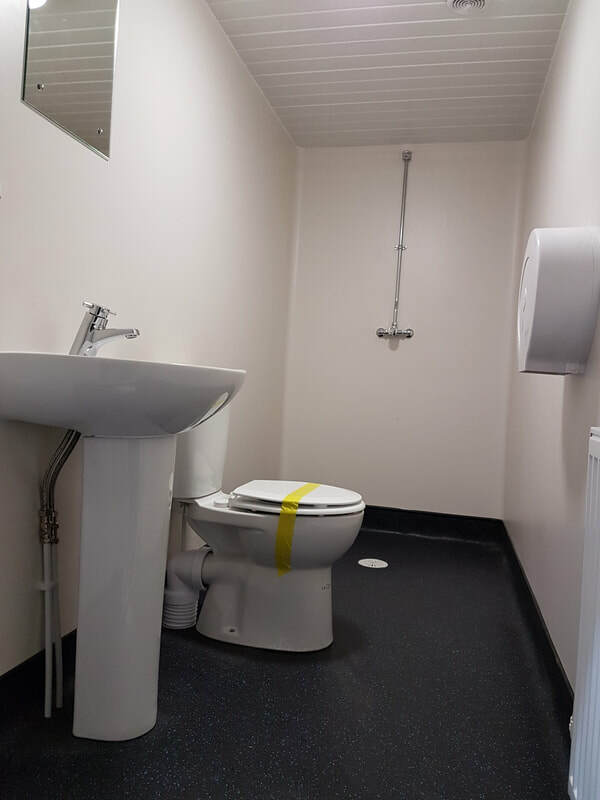 Any combination of toilets, showers, changing room, laundry room or washing up area. 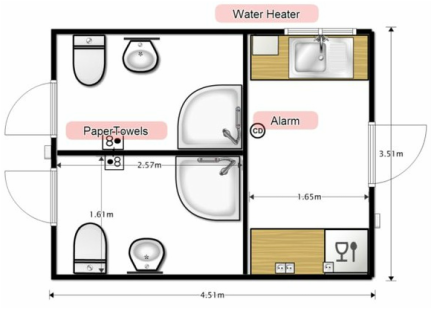 This 8 individual family rooms block contains, toilet, shower and wash basin in each of the 8 individual rooms. The Upvc outer finish is durable and long life. There is a choice of colours. The water is heated from LPG boilers. At a realistic price it is a great replacement for tired amenity rooms. Also available in smaller sizes at 20'x10' or 30'x10' with 4 or 6 individual rooms. 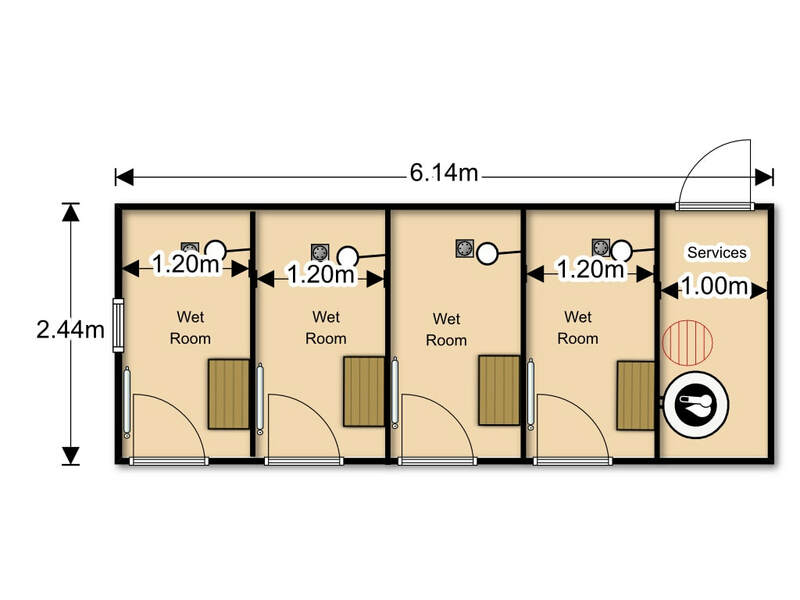 Enquire for Direct Access Family Rooms layout details. 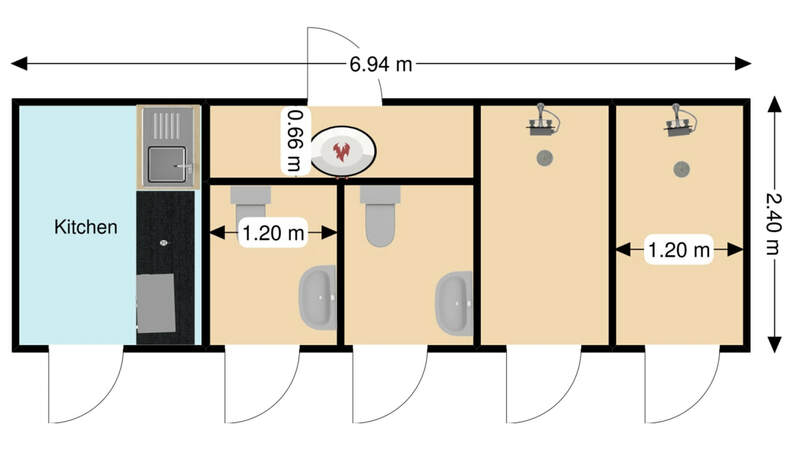 Available in 4, 6 or 8 rooms with the option to covert one or two rooms into a laundry or washing up room this is a very good value and flexible model. It can be upgraded from a colourful PVC finish to wood cladding or Canexel finish. The 30x10 or 20x10 can include a washing up room with 3 stainless steel sink / drainers included. The 8 room version is 40'x10' with 4 service rooms on the rear side. 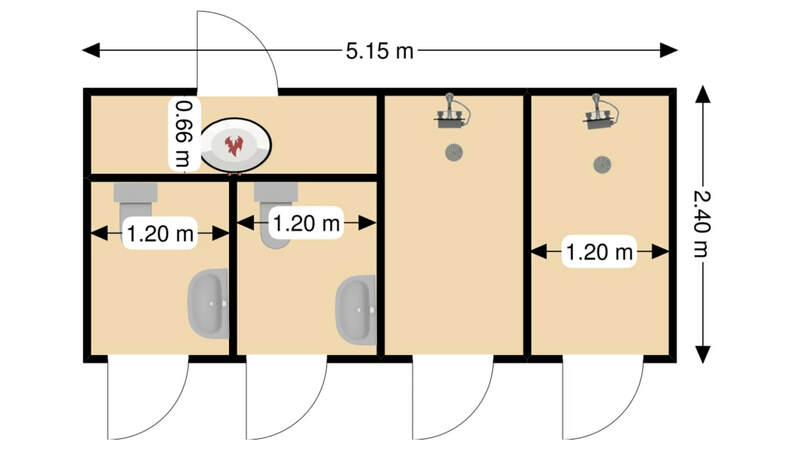 The 6 room model with additional washing up room is also 40'x10'. 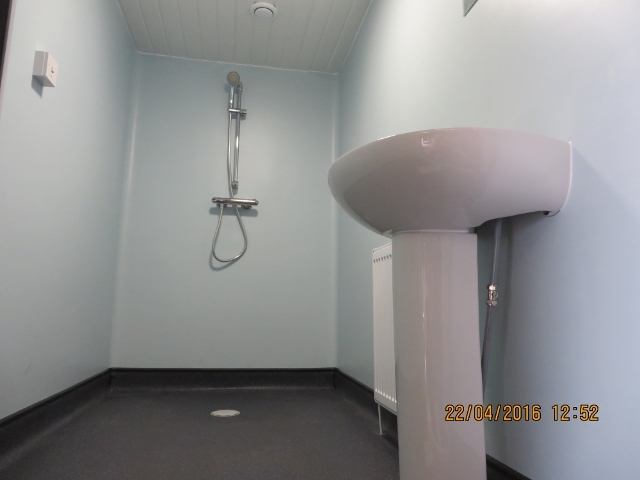 We have a disabled version which takes 2 rooms and converts it into an accessible wetroom. 2 bathrooms plus disabled, 4 bathrooms plus disabled. Call me to arrange a viewing or ask for costs and availability. 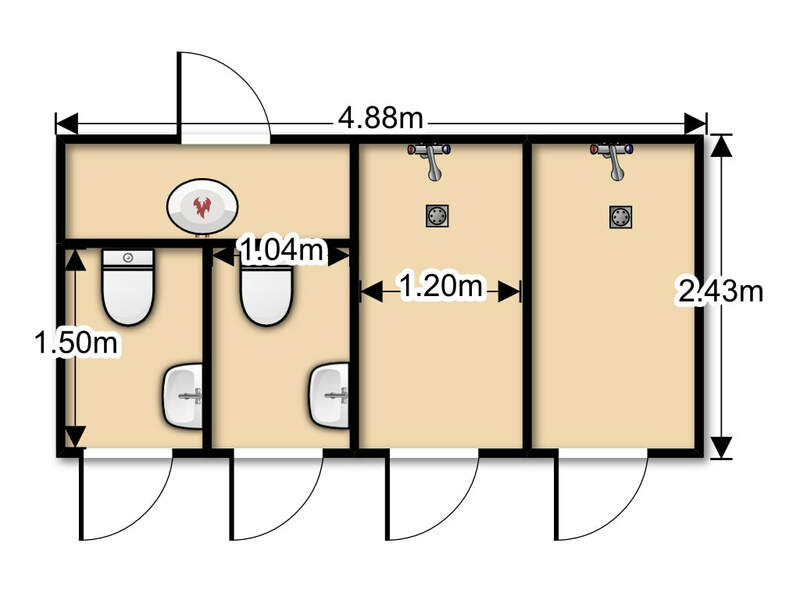 This variation show the ability to include a Washing Up or laundry area within the building. The choice of facilities is yours, but it can be powered with your own hot water, or use LPG or electric. 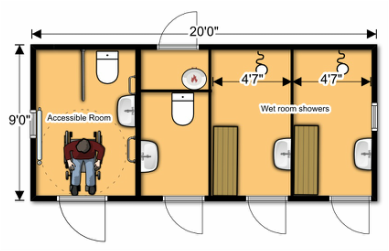 Illustration shows wet room showers and all flooring is wall lapped. Medical grade wipe down wall covering ensures a long, clean life. Layout: Jinx Bathrooms with Washing Up Area. This simple amenity block is great for small campsites wanting to either start up, or gradually expand. Building a new brick built toilet block can be very expensive. 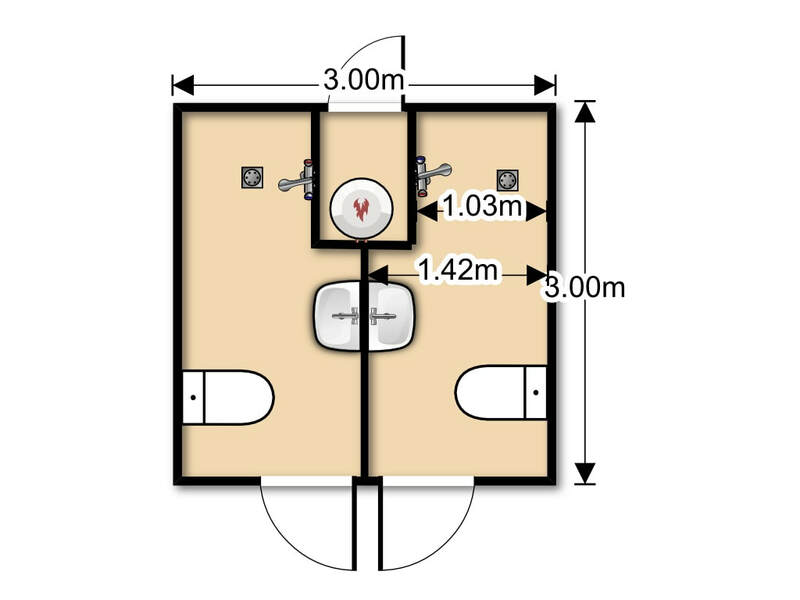 This is a simple solution, it is portable, it is robust and can be heated to provide a very comfortable range of amenity rooms. It has a facilities room that houses the boiler and acts as a store for consumables and cleaning materials. If water needs to be stored, this can be adapted to store water that can be dispensed to either side. Most of our models are chassis mounted for ease of delivery and moving around the campsite or festival location. Smaller models can be a Hi-ab lift frame. We have a range designed to meet your needs, give us a call to see if we can meet your requirements. Two toilets, 2 showers 2 wash basins and an integral washing up or laundry area. Powered by LPG or Electric. Ask for the brochure showing our Ladies and Gents and Washing Room. 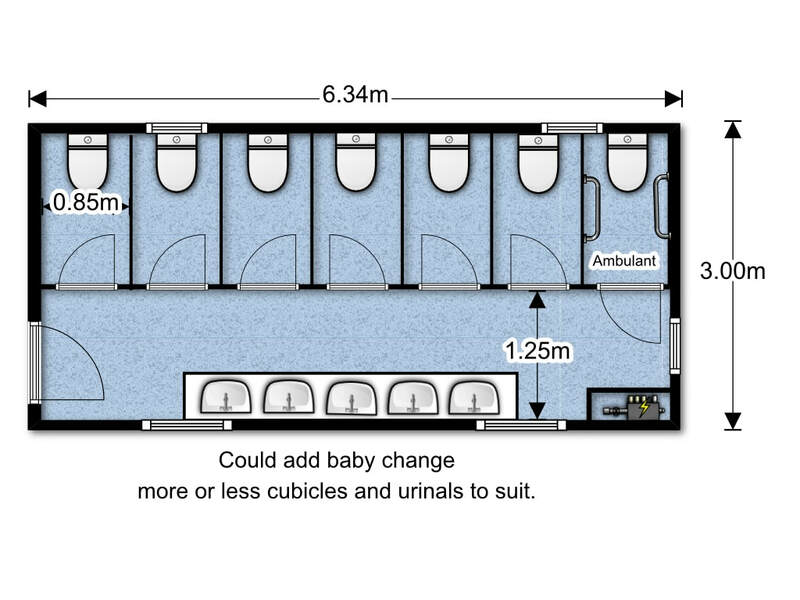 This flexible unit is a portable family room containing toilet, shower and wash facilities. We have a number of different designs and can always create one for you. It is classed as a temporary or portable building and comes mounted on a chassis.